Building a firepit with natural stones yourself may have never occurred to you. It can be done, though! If you do a little research and decide you would rather not deal with the hassle but you still love the look, there are stores online that will sell you pre-made stone firepits, too. Don't say you can't build one, though, until you read how. It may be easier than you think! To keep things simple, you will want to pick up a kit for the inside of the actual pit. This kit consists of the materials you need to ignite the fire once you have the stone structure in place. You can go for the electronic ignition kind or the match lit type in a rectangle, round, or square shape. The electronic ignition type is substantially more expensive, but it gives you more options for placement of your firepit. This Old House.com has an excellent tutorial that takes you from the shopping list to the building of your firepit. It also includes a cross-section diagram so you know exactly what you're getting into before you get started. Figure out where you want the pit to be. Remember, it's going to be permanent. Lay out the stones in a ring shape to get an idea of how it will look, then mark their locations and take them away. If you leave it to guesswork, you could find yourself doing it all over again. Dig it. Here comes some back-breaking work. You have to dig a trench for the stones. Dig down one foot, making the hole as wide as the stones you're going to use. In the center section, dig six inches down, making a flat disc-shape in the middle. Drainage is important. Fill the hole up halfway with drainage gravel so the pit won't fill with water when it rains. Make sure you have enough gravel left over to pour in more later, though. Put down the first stone and make sure it's level. Slide the next one into place next to it, lining up all the edges and make sure that, too, is level. Keep going in this manner until the ring is complete. Don't hesitate to use a mallet to ease the stones into a level position. For the second layer of stones, you'll need a caulking gun and masonry adhesive. Once you put the glue into place on top of your first stone layer, center another stone lengthwise on the seam of two lower stones. Follow suit with the other stones for this level, keeping them all tightly arranged. Work with a small area at a time because the adhesive dries quickly. Fill 'er up with gravel. You'll need enough to pile six inches of gravel into the pit. This will hold the walls steady while you add another two layers of stone around the edges as you did before. Put in a steel campfire ring. Make sure it's even with the top of the wall and fill in the extra space with more gravel. Final touch: Now it's time to organize some more natural stone. This will be the top of the ringed wall. When you build a pit, you want to make sure you use it safely, of course. Most of the rules of firepit usage are no-brainers. For example, make sure you never leave it unattended while the fire is going. Also, in most cases, you'll need to keep the pit at least twenty-five feet from your house or any combustible materials you may have lying around. Keep in mind that the fire should not be too big. 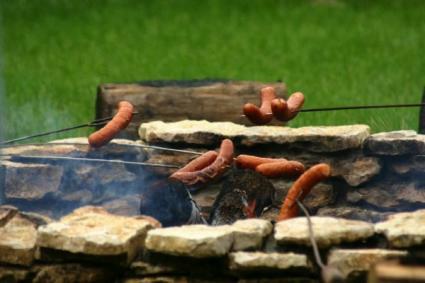 Your pit can be as big as you like, but the fire should not exceed three feet in diameter. Don't burn treated or painted wood if you end up using a wood burning pit. The Prudenzia Firepit will set you back about $800.00. If you want the designer tabletop and the lid and propane cover combo, you can pick those up on the same site.